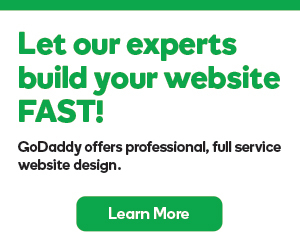 GoDaddy Email Marketing's Salesforce Addon allows you to sync your Salesforce contacts with a subscriber list, making it easy to keep in touch with customers and prospects alike. Even if you don't already have a Salesforce account, you can always grab a free trial, to test it out. Click on the Addons menu at the top of your page, and choose Add more. Scroll to the Salesforce option, and turn it on. Click the Import button to connect your accounts. You will be temporarily redirected to a Salesforce login screen, unless you're already logged into Salesforce in your browser. Enter your login credentials, here. The next page you see is an authorization page to allow access to your Salesforce account. Click Allow. Don't worry! If you see that Mad Mimi is requesting permission, it's not a mistake. The engine that runs our Email Marketing platform used to be called Mad Mimi, and so the authorization screen might not have been updated. However, you can rest assured that this is for your GoDaddy Email Marketing account access to Salesforce, and not anything else. You will now be returned to your Salesforce Addon page, and your import will begin, automatically. A message should appear saying the import is running. You will receive an email notification at your account email address when the import has successfully finished. Head to your Subscribers area to check out your new Salesforce list! Scroll down the page, to your Automatic Lists section, in the left sidebar. 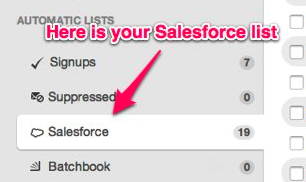 You will find the list there, labeled Salesforce.